Attached is the bench my brother set up for me yesterday. I am so proud of it. Thank you so much. Also, thank you for being such a pleasure for my Mom to work with. She would forward some of your e-mails to keep us informed and she also mentioned how nice it was to work with you. I just wanted to share some pictures from my friend's garden and how beautiful the bench looks. It was a beautiful day of remembrance for our beloved friend who we lost too soon. The natural elements of the bench and the beautiful inscription are perfect. I gave the widow the newsletter from Notre Dame that told about the walk of life benches that you helped create, which she really enjoyed. Scott, sorry it took so long to get pictures of the memorial bench you did for our family. My son put it together awhile ago but I didn’t get pictures until recently.Everyone that has seen it thinks it is a perfect way to memorialize the brothers since that was their favorite place. Thank you again for the work you do to provide such a beautiful reminder of loved ones. I am sure you have been a great blessing to many families including our own. I can't tell you what a special weekend it was with the bench. Thank you so much for making it happen for us and the David's! The family was amazed at the memorial ceremony and by the beauty of the bench when they saw it. I can't tell you how much I and the family appreciate: your labor of love, your skill and your attention to the finish of a project that can never be duplicated. The bench arrived as scheduled yesterday.This morning we did the install, which went smoothly per your instructions. Here are a couple of photos. Please put me down as a very satisfied customer, and feel free to use me as a reference should it be of any benefit. 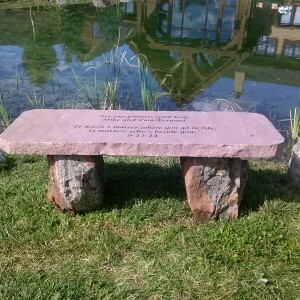 Just wanted to let you know that the bench and stones arrived as scheduled a couple of days ago. It really looks great. We will be working to develop the site where it will be placed at and will get you pics once everything is set up. Thanks again for the great work! I wanted to thank you again for your beautiful work and to let you know the bench is up and stunning. It looks fantastic. The kids at the school have really shown respect for it and it seems to be quite the conversation piece. Jack's Mom and I planted the mums surrounding it and I think the planting and the bench has been a wonderful salve for wounded spirits. Thank you again! It was a pleasure to do business with you.